SEATTLE WATERFRONT character, Ivar Haglund (1905-1985), is mainly remembered for his successful string of seafood restaurants & the fabled publicity stunts he pulled on all of us. Far less well known is his background as a guitarist, singer, and aspiring radio and TV star. As a mere lad Haglund was afforded vocal lessons, & after picking up the ukulele & guitar he began performing around town -- including, a spell with the UW Varsity Glee Club in 1927. To be sure, life certainly was pleasant for him: Haglund had inherited his grandparent's Alki waterfront property, & was able to live a bohemian existence of unemployment, beachcombing, wine-making, & guitar strumming. 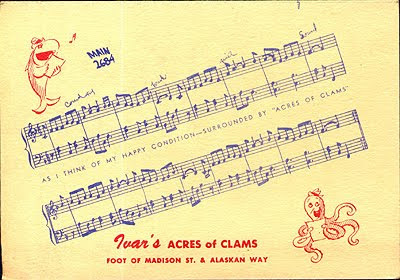 In 1938 Haglund opened an aquarium on the downtown waterfront, & he advertised it by busking outside on the street with his guitar – singing silly little ditties like “Oscar The Octopus,” “Halley The Halibut,” & “Hermie The Hermit Crab” that he’d penned about the various critters inside the aquarium. A slot at tiny KRSC radio followed, then one at KOL -- & finally, in 1940, a desperate program manager at KJR (the major NBC Network station across town) pleaded with Haglund to fill in when some scheduled guest failed to show up. It was in 1941 that Haglund befriended a couple of folkies -- Woody Guthrie & Pete Seeger -- who came rambling through town to perform at several labor union halls, & they ended up as the houseguests of Haglund where their friendship blossomed. In 1942 Haglund performed in the Moore Theater's Earl Robinson Comes Home -- a revue organized to salute the return of West Seattle's songsmith, Earl Robinson, who had gained fame for his lefty tunes, like "(I Dreamed I Saw) Joe Hill." Then in 1944 KJR launched Haglund's own prime-time, weekday Around the Sound show which brought him greater exposure – & secured the success of the aquarium. 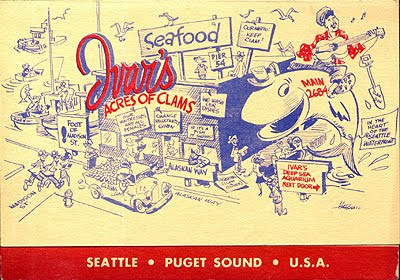 The show’s theme song was “The Old Settler” – re-titled as “Acres Of Clams.” In 1946 Haglund announced – with the advertising card shown here – the opening of a seafood restaurant, Ivar’s Acres of Clams, near the aquarium. 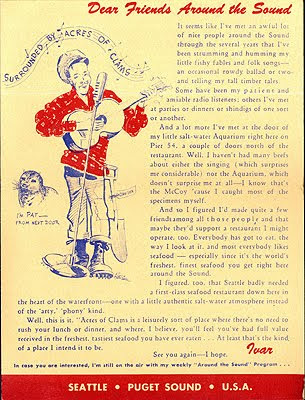 The following year another local radioman, Don McCune, invited Haglund to appear as “First Mate” on his show, and later – when McCune got his KOMO-TV kiddie program, The Captain Puget Show, where the duo sang sea chanteys. In 1958 Haglund performed “The Old Settler” on a nationally broadcast TV special & among those watching from New York, was Robinson who was inspired to score an arrangement suitable for a full orchestra. And that version – renamed “A Country Called Puget Sound” – made its concert debut on the Canadian national radio network, & was revived again in a high-profile appearance when the Seattle Symphony Orchestra (under the baton of the Maestro, Milton Katims) performed it at Seattle's new Opera House in 1963.